A total of five people were transported to the hospital with non-life threatening injuries following a drive-by shooting in East San Jose Sunday night, according to police. Kris Sanchez reports. 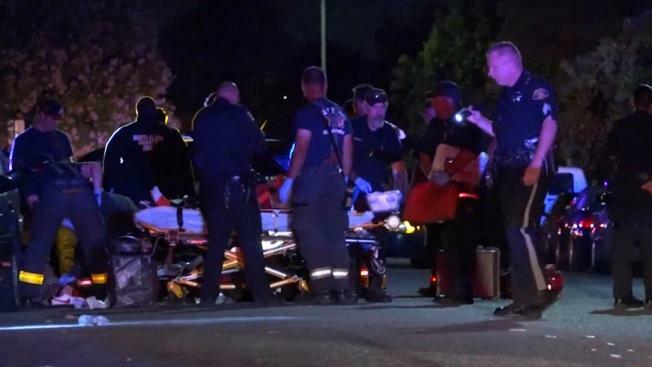 A total of five people taking part in a vigil Sunday night were transported to the hospital with non-life threatening injuries following a drive-by shooting in East San Jose, according to police. The shooting occurred around 10:30 p.m. along the 1700 block of Vista Glen Drive, according to police. Responding officers found two women and three men suffering from gunshot wounds, according to police. Police originally reported that one woman and four men were hurt. No suspects have been located at this time, and a motive is not yet known, police said. About 20 people were gathered at the vigil, which was being held for people previously killed in a traffic crash, when the shooting occurred, according to police. A neighbor told NBC Bay Area he has seen a handful of people coming and going from a home believed to be the location of the shooting in the last week. The shooting sent his sibling diving for cover. "I have a little 8-year-old sister, and when she heard the gunshots, she got really scared and her first instinct was to hide behind the couch," the neighbor said. Fire officials previously reported that six people were transported to the hospital.